If you love Mexican food you are going to enjoy today’s post! 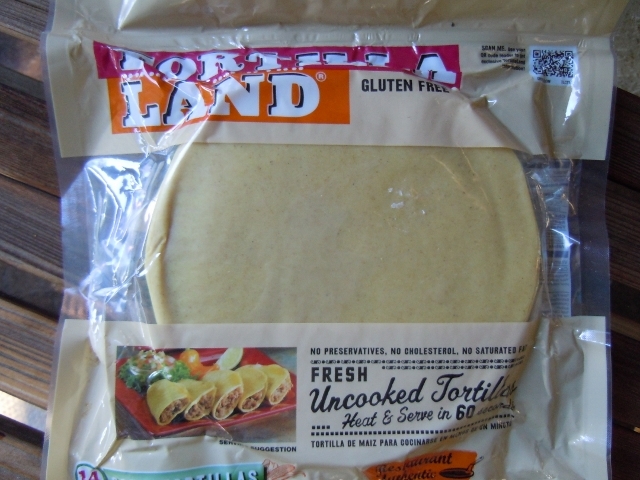 I recently received some free Tortilla Land Gluten Free uncooked corn tortillas and was asked to post a review of them. I already knew they would be good as I have enjoyed their uncooked flour tortillas in the past. 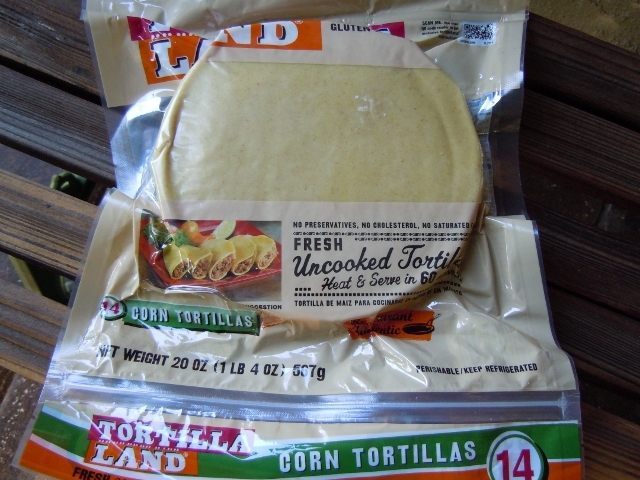 My daughter and son in law have been buying these uncooked corn tortillas and raving about how delicious they are. I decided to use them in Healthy Girl’s Kitchen recipe for Mushroom Kale Spinach Enchilada Casserole and Roasted Poblano Cream. It might not sound that appealing but let me tell you that this recipe is nothing short of amazing! You will want to lick your plate clean and pray there will be leftovers as it is just as delicious the second day. You will find these tortillas in the refrigeration section of your grocery store. Check out the Tortilla Land Facebook page. They are uncooked but only take seconds to heat up and cook on a flat griddle or pan on your stove top. Since you are making them fresh the flavor and texture is amazing! They aroma, texture and taste are so much better than already prepared tortillas. You have to try them for yourself to see what all the fuss is about. Fresh is best! Corn tortillas are my favorite but they also make flour ones. This enchilada casserole was even better than I had hoped for. 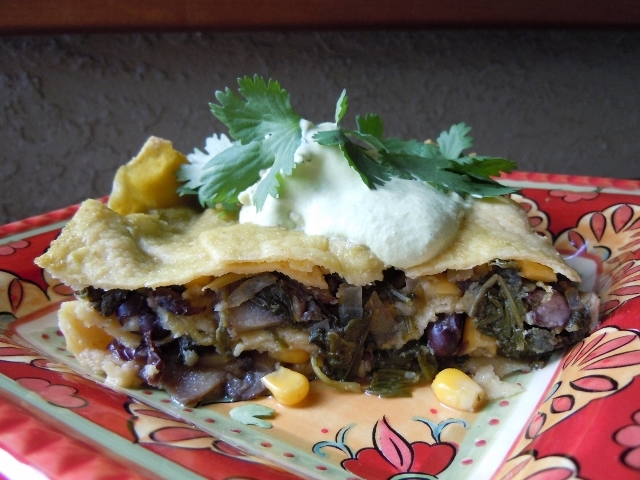 It’s packed full of flavorful ingredients like kale, corn, mushrooms, spinach, garlic, black beans and onions all sandwiched between layers of fresh Tortilla Land corn tortillas. I made this dish in my lasagna pan and it worked out well. You can see how thick and filling this casserole is. The servings are huge! This recipe does take some time to make but its well worth the effort and is company worthy! 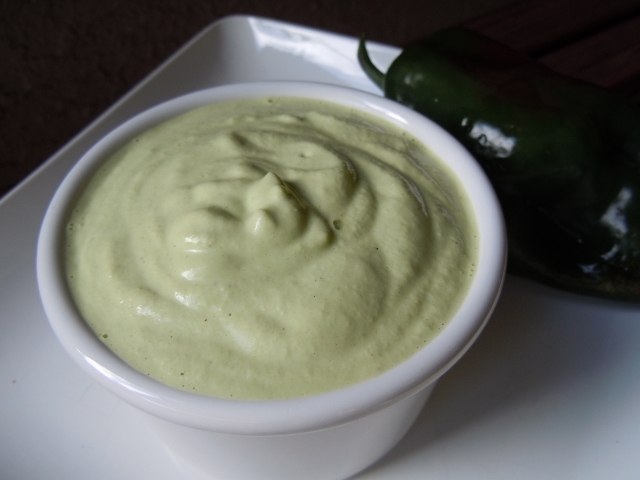 Although the Mexican casserole can stand on it’s own this Roasted Poblano Cream took it over the top. It is bursting with flavor from a roasted poblano chili that has been blended with cashews, garlic and lime juice to become all creamy and then dolloped on top of the steamy hot enchilada casserole. OMG! You will want to make this creamy topping every time you have Mexican food – really it’s that delicious. Make it and see for yourself – you will come back and thank me and then you will need to go over to Wendy’s blog Healthy Girls Kitchen and thank her too. Place a large dutch oven over high heat. Coat the base of the pot with vegetable broth. When broth is simmering, add onions and stir. Let onions saute, stirring frequently, until onions are translucent, about 10 minutes. You will need turn the heat down as the onions cook to prevent burning. Add garlic and stir. Let cook for 5 minutes. Add mushrooms and stir. Cover pot and let cook, stirring occasionally, for 10 minutes or until they cook down. Add kale and stir. Cover pot and cook for 7 minutes or until kale has wilted. Add spinach and stir. Cover pot and cook for 5 minutes or until spinach has wilted. Add 1/2 jar of salsa verde and stir. 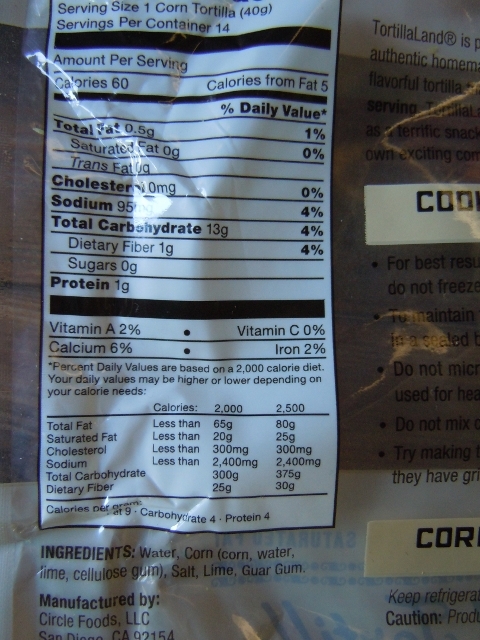 Add frozen corn and black beans. Stir until everything is well incorporated and remove from heat. (2) Place poblano pepper directly on top of a gas flame. Turn frequently until pepper is blackened on all sides. Follow directions above from placing pepper in a bowl and covering. You could also do this on a BBQ grill. Begin by coating the base of a 9″ by 13″ casserole with 1/2 jar of salsa verde. Place tortillas in a single layer to cover the bottom of the casserole, cutting one tortilla into pieces to fill in large gaps. Scoop half of the Mushroom, Kale, Spinach filling over the tortillas and gently smooth out into one uniform layer. Repeat with another layer of tortillas. Pour 1/2 of the jar of salsa verde over the tortillas and spread evenly over tortillas. Scoop other half of Mushroom, Kale and Spinach filling over tortillas, smoothing filling into a uniform layer. Place another layer of tortillas followed by the final 1/2 of the jar of salsa verde spread over the tortillas. Notes: Left overs freeze well including the roasted poblano sauce, it turned a little darker from freezing but tasted just fine. I froze the cream topping separately from the enchilada casserole. This post is featured on Healthy Vegan Fridays. 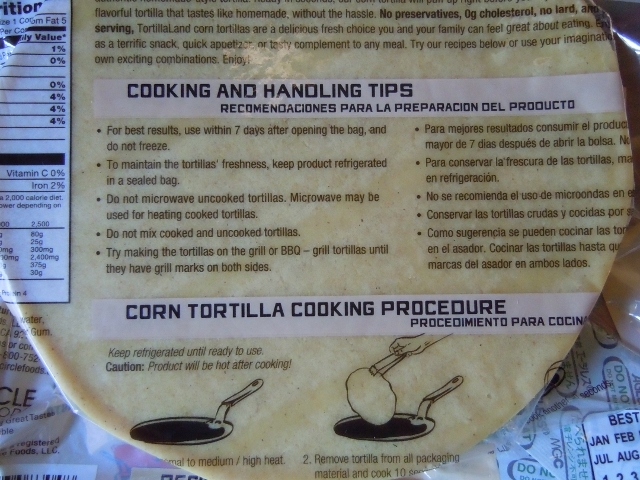 I did receive the Tortilla Land Corn Tortillas for free from the company but the opinions expressed here are my own. I can’t believe it’s Friday already people! I got my house all cleaned yesterday so today can be a day of errands. I need a few ingredients for recipes I might make over the weekend – I actually seem to cook more during the week and less on the weekends. We eat out a little over the weekend and usually have leftovers to eat up. It works for me. I hate going to the grocery store over the weekend – it is so crowded and not nearly as peaceful as a weekday shopping spree. I bought fleece material to make a warm blanket for our TV room. Hubby Tom asked me if I could make a throw that would be long enough to cover him completely – at 6’1″ and our son at 6′ 4″ most afghans and throws don’t cover them up. I bought 2 1/2 yards of fabric so I think that will work. Finally they will have a throw that their feet aren’t poking out from! At 5’4″ and shrinking – I don’t have that problem. I used to do a lot of hand crafts from crocheting to embroidery,wreath making, water color/ink drawings and the like. Then as the kids were growing up and we got busy with their activities I had the desire but not the time. That’s when I had a closet full of good intentions lots of supplies that never saw the light of day! It might be time to revisit my creative side again and see what’s new in the world of hand crafts. Pinterest here I come! 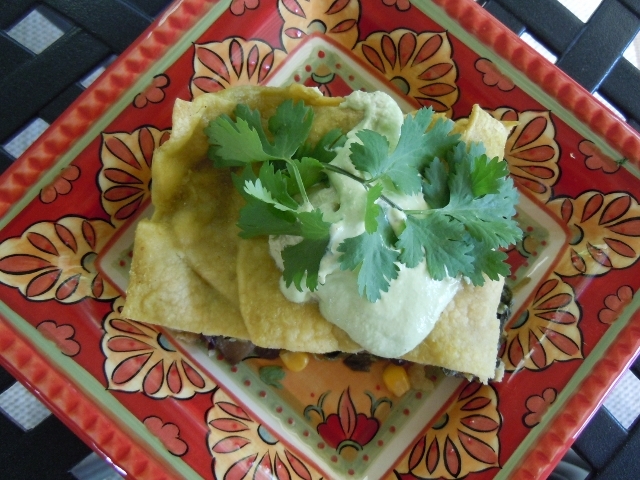 Mexican Food – love it or hate it? I am kind of ambivalent on Mexican except for the margaritas & chips/salsa which I love but don’t eat anymore! 😉 I don’t do cheese so…. This sounds sooo incredible!! I love that you can make something so tasty without any cheese. So pretty, too! I love Mexican and thought it was mostly for the cheese (lol) but I would really dig this. I used to be crafty in high school but my love for food completely took over my crafty side and that’s how I use my creativity now. I don’t know how to knit, crochet, sew….and I so want to so I might take a class some day. I also want to learn to play the piano. I love Mexican food but don’t make it very often. The tortillas sound great. I’ll have to look for them. I shared my first project on today’s post! A masterpiece!!! Thank you for sharing this lovely recipe Tami! We look forward to sharing it with our followers.